IMAGE: A molecatcher’s gibbet on Malham Moor, photographed by Martyn Gorman as part of a project to photograph every Ordnance Survey grid square of the United Kingdom. There is nothing more likely to raise the blood pressure of a British gardener than a fresh molehill despoiling his carefully tended lawn. For farmers, moles are an agricultural as well as an aesthetic pest, as covering pasture with soil reduces its appeal to livestock, and thus its yield per acre. 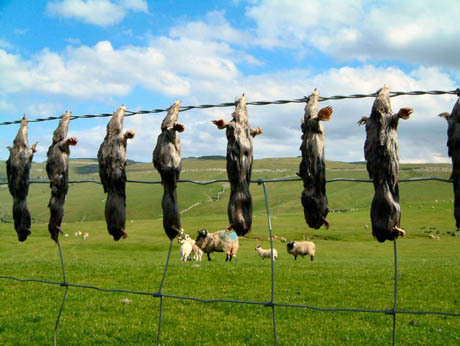 In response, molecatching is a long-standing and proud profession in the British Isles. Although poison and gassing became the preferred methods of mole control toward the end of the twentieth century, recent years have seen a revival of interest in traditional mole trapping techniques. 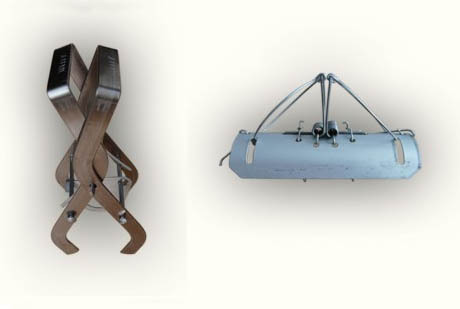 The British Traditional Molecatchers Register offers regular field trainings, with instruction in the “topography and characteristics of mole workings” as well as the proper adjustment and tuning of mole traps. 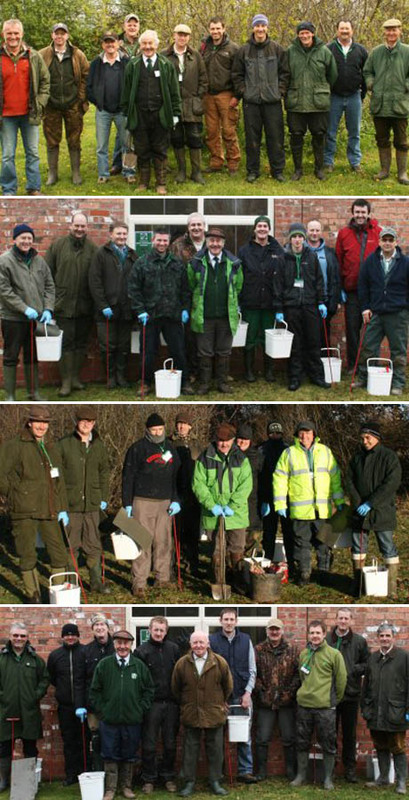 IMAGE: Proud molecatchers, photographed upon completion of the British Traditional Molecatchers Register training course. While the mole itself has an interesting edible geography — they paralyse earthworms with their saliva, and then drag them back to specially constructed underground larders capable of storing up to a thousand worms at a time — until yesterday, I had never heard tell of their consumption by humans. I knew that molecatchers frequently used to skin their prey to turn into jackets, trousers, and hats (today’s moleskin fabric is a densely woven cotton fabric, sheared short on one side to mimic a mole’s velvety pelt). And, as molecatchers were often employed by an entire parish to control the local mole population, they would also hang their catch on gibbets, as proof of work. 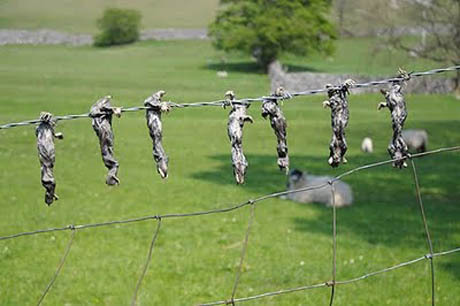 IMAGE: Moles drying in the open air in Upper Wharfedale, via Ten-inch Wheels. But I was surprised to read that in Upper Wharfedale, Yorkshire, dried mole meat is a prized delicacy. According to Ten-inch Wheels, a Vespa-obsessed, London-based designer and blogger, it is the last place in the country to still have a “mole-drying industry,” with “a couple of dozen” drying frames dotting the Dale. 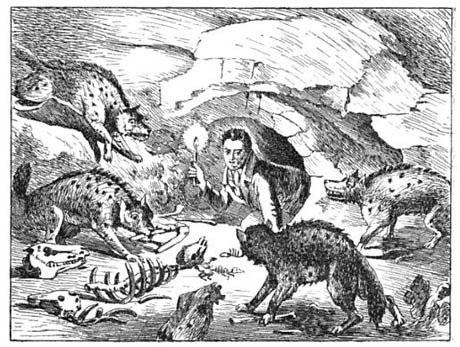 IMAGE: An 1882 cartoon of Wiliam Buckland sticking his head into a hyena den, drawn by geologist William Conybeare, via. Once, when visiting a cathedral, he was told of a local legend claiming that fresh saints’ blood was to be found on the floor. Buckland, never one to turn down the opportunity to try a new flavour, licked the flagstones and was able to disprove the myth, immediately identifying the mystery liquid as bat urine. Probably the most extraordinary of the great man’s exploits came on a visit to Lord Harcourt, the Archbishop of York, at Nuneham Courtenay, just outside Oxford. Shown what was claimed to be the heart of Louis XVI, preserved in a silver casket (Harcourt was a collector of esoterica), Buckland immediately gobbled the fleshy artifact down, unable to resist the opportunity to chow down on the heart of a king. However, based on his extensive taste-testing, Buckland pronounced only two living creatures as unfit for human consumption: bluebottles and our friend the mole. So, London-based readers, consider this a warning. If a man on a Vespa offers you mole jerky, sun-dried on the barbed wire of the Yorkshire dales, it might be best to politely refuse. 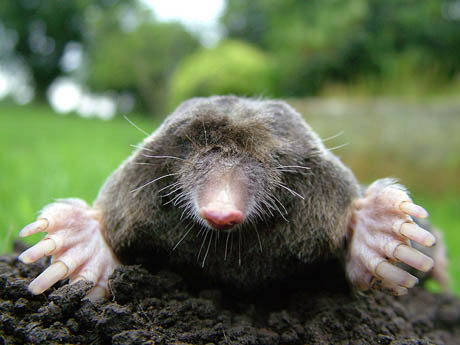 IMAGE: The mole: neither attractive nor tasty. Photograph by Michael David Hill. Thanks to @mondoagogo for the link to the spurious but intriguing Ten-inch Wheel story. I live in Quincy, Michigan and I’m a woman Mole catcher. I’m the Mole Lady! In the past 5 years I’ve Speared 421 moles with a fishing spear, A couple years ago I speared an Albino Mole. I had him stuffed and mounted. They do seem to be somewhat lacking in diversity!